Every baker should know how to make a proper Swiss meringue buttercream. Not only is it one of the best buttercreams with which to ice a cake or a batch of cupcakes, but it is also one of the easiest buttercreams to make. If you've never had the pleasure of tasting a true meringue-based buttercream before, then you're in for a real treat. I find this very stable buttercream a pleasure to work with whenever I want to pipe rosettes, stars, pearls, flowers or any number of shapes with my piping bags. A sampling of Swiss meringue buttercream will call to mind vanilla ice cream with the smooth texture of sweet, softened butter that is light, airy, tempting, and not too sweet. It's exquisite. Yes, you can most certainly custom flavor the buttercream to your liking with any number of extracts or with the addition of fruit curds, jams (strained of course) or melted and cooled chocolate, and you can tint it from a variety of colors to make cakes that are true works of art. The basic buttercream can be used any number of ways. This crumb-coated two layer cake shows just how smooth the buttercream is. Although many of us like the sweet flavor of confectioners sugar-based buttercreams (this type is always welcomed), it's a good thing to have a genuine Swiss meringue buttercream recipe under one's belt for those special occasions when you want something less sweet. Recipes for this type of buttercream vary slightly from author to author. The key to a perfect buttercream is about getting a good ratio of butter to sugar to egg whites, to create a stable emulsion. The ingredients are few and the technique, as I said, is quite routine. After making this recipe or anyone else's a few times, you many not even need to look at it ever again because it truly is easy. This is how you do it. Yield: approximately 4 cups of buttercream. This will fill, crumb coat and ice an 8" or 9" double layer cake. If you want to decorate the cake with rosettes, stars, etc., double the recipe. Leftover buttercream will freeze for up to one month sealed properly. 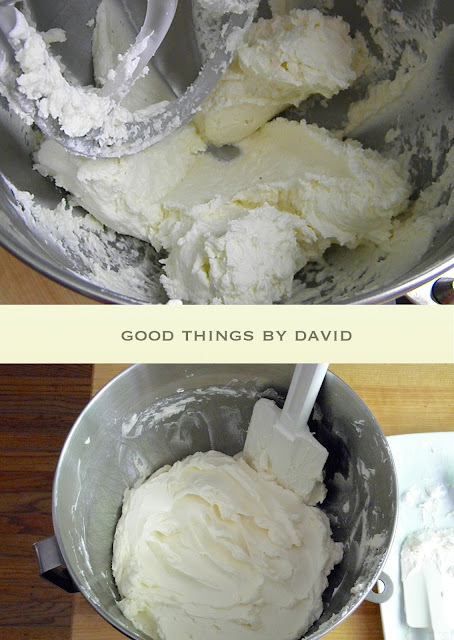 I like making my buttercreams with a stand mixer, using both the whisk and paddle attachments. If you're lucky enough to own a paddle attachment that has those rubber wiper blades, use it for this recipe. I find it to be most useful for this preparation, because I don't have to stop the mixer to wipe the bowl down of all that meringue as I'm adding the butter. 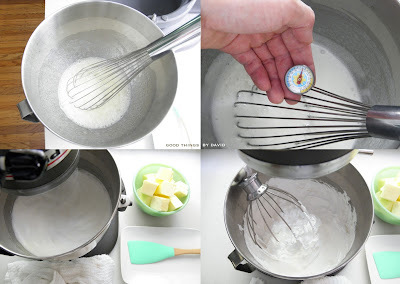 In the bowl of your stand mixer set over a pot of simmering water, whisk the egg whites and granulated sugar until the sugar has dissolved and the mixture reaches between 115F to 120F on an instant read thermometer. Make sure that you're whisking the entire time the meringue is on the stovetop so that you don't accidentally curdle the eggs. Once the meringue is the proper temperature, attach the bowl and whisk attachment to the mixer and whip on high speed. Continue whipping the mixture until you have thick, glossy meringue and the mixture has cooled to room temperature (this can take anywhere from 5-7 minutes). Touch the outside of the mixer bowl and check to see if the mixture has cooled down significantly. You can hasten this by holding a dampened kitchen towel to the bottom of the bowl as the meringue is being whisked. Stop the machine and inspect the meringue. It should look like this. 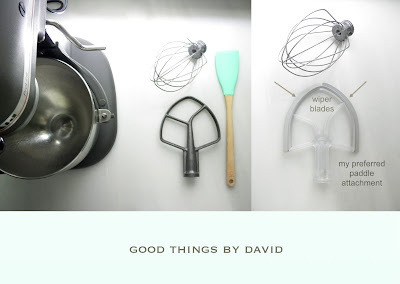 Scrape down the mixer bowl and the whisk attachment of meringue. Reattach the bowl to the mixer and fit it with the paddle attachment. Turn the speed to medium and begin adding the butter, bit by bit. You want each addition of butter to be absorbed into the meringue before adding more. Once the meringue has taken all of the butter, you will notice that it will begin to look curdled (above) and at some point, the mixture will break down. This is normal. Keep whipping the mixture on medium (KitchenAid speed 5 or 6) until it smooths out. Add the fine sea salt and the extracts last, once the buttercream has come together. Stop and inspect the buttercream. When it's ready it should be ultra smooth and creamy. The closeup above shows you what it should look like. Go ahead, give it a taste. Isn't it good? You can use the buttercream straight away or you can keep it at room temperature, well-covered, until ready to use that day. Make sure that if you're not using it straight away, that it's in a cool part of the kitchen. If you refrigerate the buttercream, you must let it come to room temperature and whip it well with a spatula to smooth it out before icing a cake. Frozen buttercream will keep in a zip top bag for up to one month. Thaw in the refrigerator overnight and bring to room temperature before rewhipping with a stand mixer or handheld mixer. The moment you begin to coat cake layers in this buttercream, you will instantly take to it. Notice how easily and smoothly it applies, without tearing into the cake. If you like white cakes, chiffon cakes, genoise layers or any cake that's delicate, a Swiss meringue buttercream will be the type of icing you want to decorate them with. This buttercream doesn't have to be reserved for cakes only. Use it for mini, regular or jumbo cupcakes. It is a dream on these dainty treats! For my birthday cake, I had to use this buttercream on the white layers because I knew that they were delicate. I can't wait to make this cake again very soon. I told you it was a 'piece of cake' to make Swiss meringue buttercream. There is nothing daunting or difficult about making this buttercream at home, as long as you pay attention to the consistency as the buttercream is coming together. Pipe away to your heart's content when you have a batch of Swiss meringue buttercream and a couple of cake layers. However, if you want to keep things simple for cake layers, cupcakes or even loaf cakes, all you really need is a spatula to spread the sweetness. Make Swiss Meringue Buttercream once, and you will become a fan of it. Make it twice and you will find yourself wanting to bake cakes more often. I can guarantee it. There's nothing like a delicious cake to celebrate a milestone. My very own birthday cake this year was a white cake filled and frosted with light-as-a-feather Swiss meringue buttercream, all set on top of a collectible jadeite cake stand. I've designated this particular cake my 'favorite birthday cake' because it has all of the qualities that I like about cakes. It's light, delicately flavored and bakes beautifully, which is just what I'm after whenever I bake a cake. I've told you before that I bake my own birthday cakes because I can't abide by store bought. What's more, the tradition of homemade birthday cakes has been the standard ever since I was a kid. Mom spoiled us that way and I certainly wouldn't have it any other way. Not now. Not ever! As is typical in the weeks leading to my birthday, I scour baking books in our home library in search of cakes that pique my interest, concentrating on those I haven't tried before. I also do my online homework and see what's out there. Are you familiar with this cookbook, Baking Illustrated? You should be. In it is a perfect recipe for a white cake which employs the 'high ratio' method of cake baking. This is simply mixing the dry ingredients first, then adding the butter until the batter is lightened, which ends with the addition of the eggs and milk. If you've never tried this baking method I highly recommend that you do. Cakes bake up light, not dense, and the finished crumb is tight, yet delicate. It helps that the recipe includes good ingredients. My next post will be all about Swiss meringue buttercream. Most of these formulas are pretty standard, as there is little one can do to change them. However, with a good combination and clear instructions, you too can make a lighter-than-air buttercream that can grace any cake or cupcake. After the cake layers are baked and cooled, I always wrap them well and then chill the layers thoroughly before I begin decorating. This helps firm them up and makes it much easier to apply the crumb coat. It's up to you if you want to use a cardboard cake round, but I like them so that I don't encounter problems moving them from the decorator's turntable to my cake stand. These rounds also help protect the cake stand from nicks and cuts when you slice into the cake. Apply a small amount of icing to the cake turntable before putting the cake round. This helps anchor the cake. Do the same to the cake round before centering the first cake layer. Any uneven cake layers should be leveled at this point by slicing away or trimming any bumps. Add about 1/2 cup of icing (or more if you really like buttercream) to the top of the first layer. Carefully place the second layer on top, making sure it's centered. Immediately place about 1 cup of buttercream on top of the cake and begin to spread it to the edges, rotating as you go. If you notice, the excess buttercream is teetering over the sides. 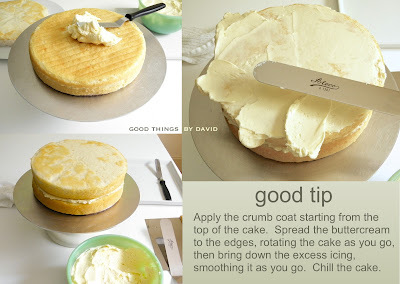 Simply drag that frosting down and begin to smooth the sides with it, rotating the cake turntable as you go. This is your crumb coat. You're not after perfection here. All you want is to seal the cake and prevent any troublesome crumbs from marring the final coating of buttercream. Once the crumb coat has been applied, chill the cake for at least 30 minutes before continuing. The final coating of buttercream should be applied evenly with an offset spatula. For straight, even sides, I like to use a bench scraper held perpendicular to the surface of the decorating turntable, rotating the cake to smooth out the buttercream as I go. I don't worry about gaps at the bottom of the cake at this point, because the final touches are done when I transfer the cake onto a cake stand. 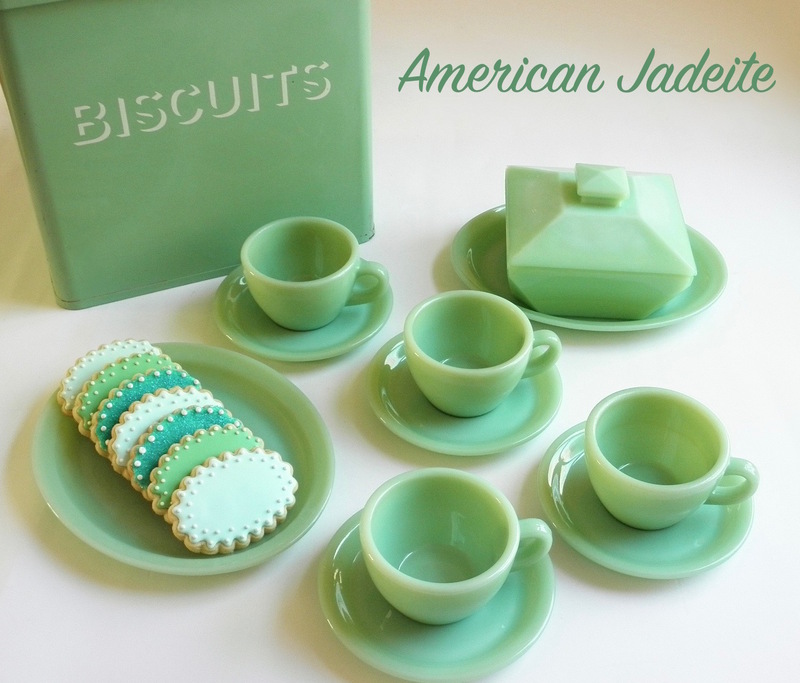 That jadeite L.E. Smith Glass cake stand is a Martha by Mail collectible, and is among my favorite cake stands. It was a Christmas gift from a very dear friend of mine. If you want to make decorative touches to your cake, it helps to have extra buttercream at the ready for this purpose. I sometimes scale up my buttercream recipes by 50% or I double them if I know I want even more frosting. For this milestone birthday cake, I gave it a simple design of piped stars on top of the cake and along the bottom border. The finishing touch was the application of French silver dragées in the middle of the piped stars. Voilà! The birthday cake is done. Other than the basic star design of the piped buttercream, I love the addition of those silver dragées because they add a bit of sparkle. To serve my cake, I had to use some vintage Fire King jadeite. The clean lines and thick glass of the restaurant ware pattern and the L.E. Smith Glass cake stand complement one another. I love these pieces. The white cake slices beautifully. Can you see how light that crumb is? What I like about this recipe is that it uses almond extract in the batter. The flavor and aroma bring back so many good childhood memories for me. Mom always included a tiny bit into her white cakes for weddings. You can, of course, omit the almond extract. I hope you can understand why I call this my 'favorite birthday cake'. Any leftovers will keep for up to two days in the refrigerator. Serve great, big wedges of this cake with a glass of milk, a cup of tea or even a made-to-order cappuccino. It's so easy to bring out the Bialetti for some tasty espresso. I want to thank everyone who took a moment to send me birthday wishes, via phone, online and in person. There's nothing like celebrating a milestone birthday knowing that one has great friends and family. Those bonds and relationships are priceless to me. Do try this cake soon, because I know that you and your guests are going to love every piece of it. Of late, I've been obsessed with a particular recipe from a book I recently added to my cookbook library. The book is called, 'Crumb', and it's written by British food columnist, Ruby Tandoh. I simply love the style of her writing, the sweet recipes that she has gathered in one volume, along with all of the practical information which makes me go back to it time and time again. If you can say that about a cookbook, then it's a keeper and worthy of one's library. 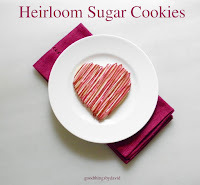 Ruby calls these little gems, Rye Oat Cookies, and compares them to graham crackers. Called digestives in England, the cookies are perfect morsels to have with one's tea or even for breakfast with a cup of coffee. Ever since I got Ruby's book, I have been making these 'biscuits' every single week, because they are good. Having said that, however, I have taken liberties with the recipe by adding some spice and bumping up the brown sugar just a smidgen. I can't really call this recipe my own, but I will share with you what I do to make it my own and how you can easily make a batch at home. 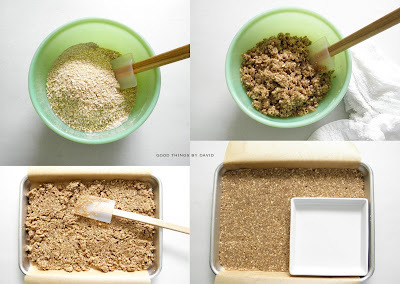 Note: the recipe requires 1 cup total of whole grain flour, along with the oats. A full cup of whole wheat flour or a full cup of rye flour can be used instead of 1/2 cup each. I've tried it both ways, but I prefer the 1/2 cup of each. Recipe is adapted from Crumb, A Baking Book by Ruby Tandoh. 10 Speed Press. 1. Butter or spray with nonstick spray, a 1/4 sheet pan (9"x13") and line it with parchment, leaving a 1" overhang on either side of the longest side. 2. Pulse the oats in a food processor until they look like coarse meal. It's OK to leave a few whole pieces, it doesn't have to be ground to a fine powder. 3. In a large bowl, mix to combine the ground oats, rye flour, whole wheat flour, sea salt, baking powder, ground cinnamon and ground ginger. Mix well. 4. Drizzle the canola oil over the dry ingredients. Sprinkle the light brown sugar over the bowl, add the milk and mix evenly with a spatula until the batter looks like wet sand. 5. Press the dough firmly into the prepared pan, making sure it is level. 6. Bake in the preheated oven for approximately 25-30 minutes, until the cookie batter is firm, set and slightly darkened. Remove from the oven and let cool completely. 7. Slice the slab into 12 squares. Cookies will can be stored in a cookie jar for up to 5 days. Note: this is a very crumbly cookie and may not cut neatly. This is fine, because those crumbs can be added to your yogurt for breakfast. Waste not, want not! The crumbled cookie is a natural for plain yogurt. Whether or not you decide to drizzle this delicious combination with honey, it is superb. Try it for breakfast or as an afternoon pick me up. I hope this humble cookie captures your attention and prompts you to whip up a small sheet of them soon. Although I can't guarantee that you'll get obsessed with this 'biscuit'/cookie, knowing that each is filled with whole grain goodness will undoubtedly make you a fan of them. Fill a cookie jar with them and then quickly begin another batch. I know they're not going to last for very long. Homemade jams are one of life's little luxuries. An abundance of raspberries, can be found at farmers markets right now which can be enjoyed as is, but if you want to extend the pleasure of these summer berries, I suggest making a bit of jam so that you can stir some into a bowl of yogurt or oatmeal for breakfast, or to have on buttered toast with your tea. Because it is homemade, you don't have to worry about preservatives, corn syrups or other unpleasant ingredients that are often found in supermarket jams and jellies. Here at home we've been having a bumper crop of raspberries, and now it appears as if we'll have an abundance of blackberries in the near future. We picked a few blackberries a couple of days ago, but there are many more waiting to be plucked. Can you blame us for being tempted just to eat these raspberries in their natural state? Small, dark red and very juicy, the wild raspberries that grow on the property are always anticipated by us every single summer. Picking them isn't so much fun because of the thorny nature of the brambles, but as soon as my basket is full of these beautiful ruby gems, I forget any discomfort when I bring them indoors. This small tray of berries was picked the other afternoon right before dinner. Delicious! As much as we've been enjoying these tasty fruits every single day, it is impossible to eat them all, so there is only one thing to do with such an abundance. Some quick notes before we begin. When making jam, I like to cook no more than two pounds of fruit at one time, and I use the 'quick chill' method when testing for proper consistency. I do not use pectin on my wild raspberries because they are very tart and set up well with just sugar. When choosing your raspberries, in order to ensure a good shelf-life of the jam, choose fruits that are slightly underripe to just ripe. Pick through your raspberries and remove any that are blemished, squashed or rotten. Give them a rinse to remove any dirt. Using overripe berries will increase the likelihood of spoilage once the jam is done, thus reducing its shelf life. This is fine if you're only making a small batch that will be eaten right away and won't be canned for longer storage. This can be scaled up to four times. For best results do not cook more than two pounds of fruit at one time. Yield: approximately 1/2 pint for above measurements. 1. Put one or two freezer-safe saucers or plates in the freezer. Place your fruits and sugar in a nonreactive pot and give the ingredients a good stir (if making a large 2lb. batch, use a 10" wide pot for this purpose). Over medium low heat, stir the contents until the sugar has dissolved. 2. 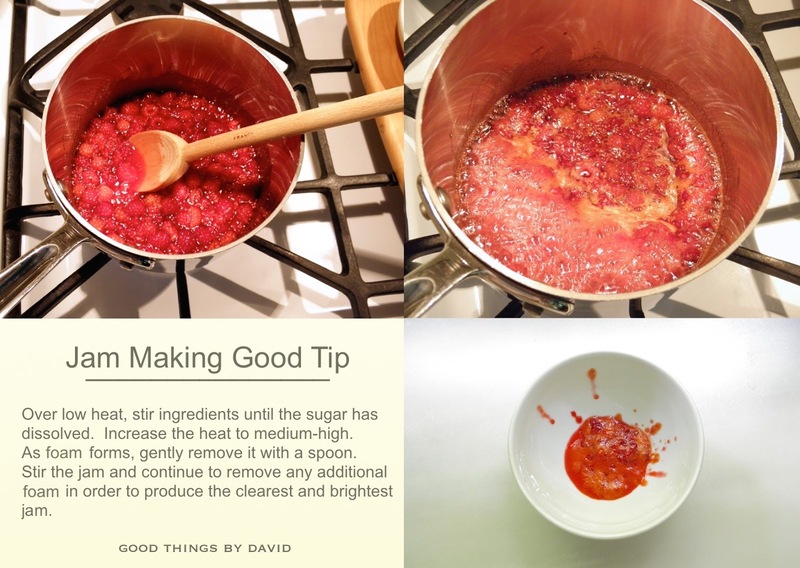 Increase the heat to medium-high and cook the jam until it's boiling, stirring to make sure the ingredients don't scorch. Have a pastry brush and water nearby to wash down the sides of the pot if you notice any sugar crystals forming. 3. Important: using a long-handled spoon, remove the foam that surfaces to the top as you're cooking the jam. I keep a small bowl nearby to discard the 'scum'. The reason it's removed is to keep the jam as clear and as fresh as possible, and to increase the shelf life of the ingredients once they're done. 4. Continue cooking and stirring until the jam has jelled properly. Use the 'quick chill' method for testing. 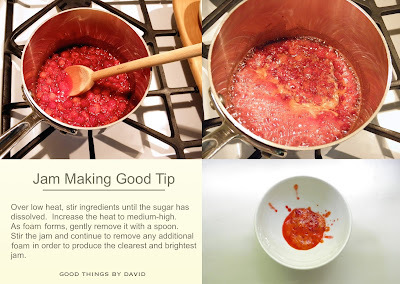 When testing, remove the pot of jam from the heat source to avoid overcooking. 5. To check for consistency, remove one of the plates from the freezer and drop a small amount of jam on the plate. Immediately put the plate back in the freezer for one minute. Remove it from the freezer, and using your index finger, push the contents to make a trail. If the jam wrinkles and your finger leaves a clear wake (see photograph), the jam is done. If the jam pools back against itself, continue cooking. Cooking times will vary. 6. Once the jam is done, have a proper funnel and prepared canning jars at the ready, and seal shut. For full instructions on proper canning, visit: National Center for Home Food Preservation (USDA Publications). If you're not canning your jam, set the bowl or jar of jam over a rack to cool and refrigerate when ready, making sure it's sealed. As much as I love my favorite store bought jam, there is nothing like homemade. I know that many of you are way ahead of me and have already been canning pints after pints of fresh summer berries. There is something soothing in watching the fruits and sugar bubbling on the stovetop waiting to be placed into jars. Knowing that you'll be preserving something that comes from the land, even if it's for a brief moment, makes the task of 'putting up preserves' that much more rewarding. You don't have to have raspberries growing in your yard to enjoy making a pot or two of jam. Visit a farmers market or a reliable supermarket and buy some good-quality, organic raspberries to make a pot of your very own jam. You might as well get a loaf of bread and sweet butter while you're there, because you're going to want to use the sweet spread as soon as possible. If you decorate cookies and cakes on a regular basis, chances are you have accumulated a good amount of sweet edible embellishments and decorating tools to help you in the decorating process. 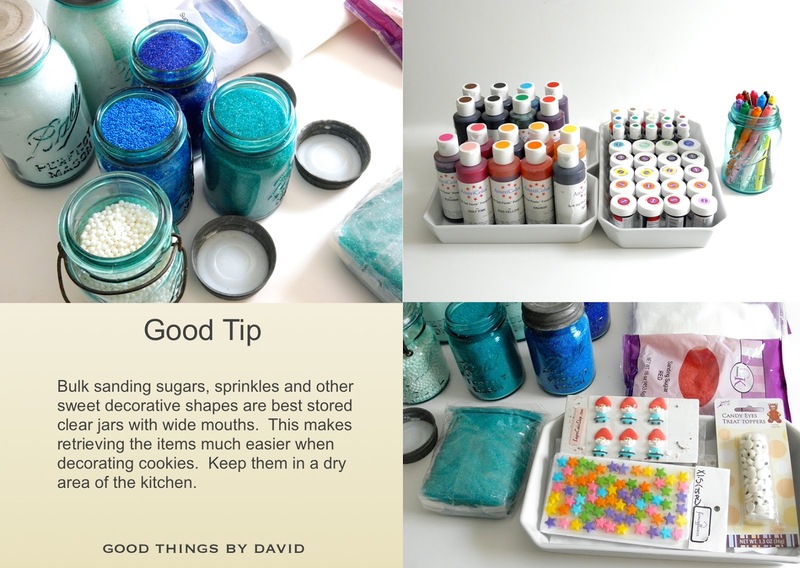 It's a good idea to dedicate a space in your kitchen, no matter how small, to house the various tools and sweet, sparkly sprinkles in an orderly way. I don't have a large kitchen with an infinite amount of storage space, but everything here has its place. 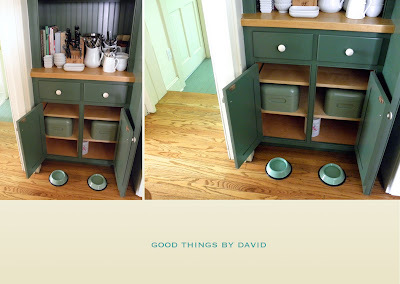 Working with what I have, I try to make the most of the cabinets, shelves and drawers. With an infusion of cookie cutters that were purchased recently from a dear friend and cookie decorating items which were given to me by that very same individual, my need for a specific cookie decorating station has forced me to move and consolidate my tools. This small area in the kitchen next to the center hall is where I used to have all of my cookie decorating equipment, so naturally that's where I began to put everything when I started to organize the new stuff. About halfway through the process I decided to stop. I knew it wasn't going to work. Although I had three shelves and two small drawers to work with, it was an area of the kitchen that felt removed from my cookie decorating area. I decided it was time for a change. Let me show you how to organize a cookie decorating area without the need for a lot of space. 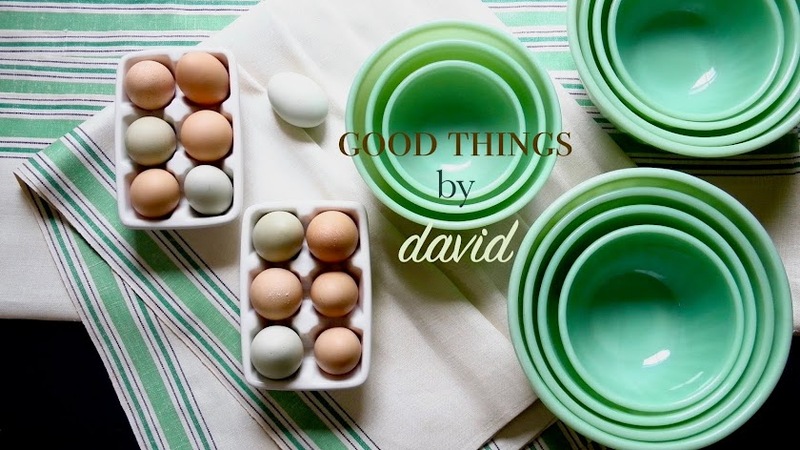 With only two deep drawers, I have managed to bundle every single item that I absolutely need to decorate the various cookies that you've seen me create here on Good Things by David. Everything is now sitting within easy reach from my dough counter, next to the large window in the pantry area. The top drawer has the most frequently used tools and items that are essentials for my cookie decorating. Cases of plain piping tips, food coloring, food writing pens, a large roll of disposable pastry bags, the 'essential' cookie cutter shapes from Ateco and De Buyer, plus powder coated steel boxes with smaller tools are located in this one drawer. Food Colors: the large Americolor bottles of food coloring which are very concentrated, along with some smaller ones, were gifts from my good friend, Janet. She was divesting herself of many of her cookie pantry items and decided to have these bottles make their way into my home. Thank You Janet! Keep reading, you'll see what I mean. Rather than throwing them into the drawer haphazardly, I gathered the colors and placed them in shallow porcelain baking dishes so that I could pull out the entire bunch if I needed to. Those round biscuit cutters are always used in the kitchen for a multitude of tasks. In the other corner, I've stacked my nesting De Buyer and Ateco cookie cutters in generic shapes such as stars, squares, plain rounds, ovals, hearts, scalloped squares and scalloped rounds. These are must-haves for every cookie baker, because they are extremely versatile. A Ball jar (sans lid) sits there with a group of writing pens at the ready. The green steel boxes (they're from Ikea) are ideal for organizing small items. This is what I have in them. Everything from my pastry bag and squeeze bottle couplers, to small cookie cutters, spatulas, tweezers, gift tags and spools of waxed linen twine are gathered into these wonderful boxes. They are extremely durable. Oversized piping tips (meant for cakes not cookies!) are placed in the box with all of my plastic couplers. It's a good idea to have at least one dozen of these couplers since they are inexpensive, and it's wise to have them in one area so that they don't get buried in some drawer. This way you can work with a multitude of colors when decorating cookies. I'm always gifting or handing out many of my cookies to friends, family and neighbors, so I have to have some tags and baker's twine nearby to package up my treats. Those spools of Irish waxed linen twine were a Martha by Mail item, as were the large round, metal-rimmed gift tags. I've even given out spools of this twine to my closest friends! They know who they are. Small spatulas, fine paint brushes, piping tip cleaners, tweezers, and even a chocolate dipping fork are kept in one box. I find all of these things to be essentials when decorating cookies. When I'm ready to start a decorating project, I remove this box from the drawer and keep it nearby. Those star cookie cutters are by Wilton and the small heart is a Martha by Mail item. The round tin of cookie cutters were a recent gift from my friend Chris. He immediately thought of me when he spotted them at a kitchenwares store in Connecticut. Tiny alphabet cookie cutters! These are no bigger than 1" each if that, but they are super cute. I have ideas to use these when appliquéing cookie messages onto a larger cookie, but I can also see them stamping out messages on cakes. Thank you for these, Chris, and yes, I will use them soon! The bottom drawer is all about sugars and sprinkles. These are also kept in powder coated steel boxes and even antique Ball jars. The middle part of the drawer has my trusted Wilton meringue powder for that special royal icing that gets added to decorated sugar cookies. 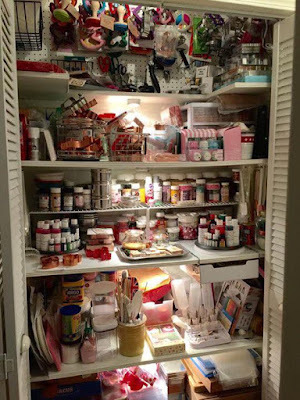 Janet's Cookie Decorating Pantry is something that always inspired awe in me because it was a one stop area for anything related to cookie decorating. 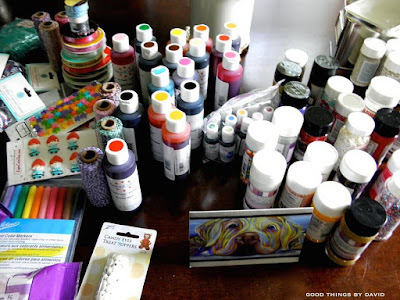 From food coloring to cookie stamps, cookie cutters to sprinkles, Janet had it all in one centralized area. This was cookie decorating heaven! This is a small sampling of what Janet sent me one day as a surprise. You see, Janet made a few changes in her life recently, and ending her large scale cookie decorating projects was one thing she decided to do. If you want me to be honest, I mourned this because I always enjoyed Janet's cookies on her blog. I'm sure I'm not the only one who has missed her wonderful creations (folks, I tried to get her to change her mind, but she was adamant). Throughout the months I will show bits and pieces of what came that day. After I got over the initial shock of these cookie decorating gifts, I had to call her immediately. Yes, there were tears. PS: I did buy a bulk of her copper cookie cutter collection, but we'll save that for another organizing post. Some bulk sanding sugars and snowball candies, as well as nonpareils, were decanted into many antique Ball jars that were sitting in a cupboard. What I love about storing these things in Ball jars is that they are easily spotted through the glass, and I can easily scoop out what I need without any trouble or replenish an item when it's empty. Look at those sugar gnomes and the edible stars! If those gnomes seem familiar, they are the exact ones I used for my friend's surprise package of garden cookies. Jars of fine and coarse sanding sugars were put into one bin, while nonpareils and sprinkles, and other candies, were placed in another box. These larger boxes are quite deep and tall enough to house the largest of sprinkle containers. Once they're closed, I don't have to look at endless bottles of sugars. Done! As I said, only two drawers, but everything within easy reach. You don't have to have a large area or an abundance of items to decorate wonderful cookies, but it is wise to have everything you need in one centralized location. Look at your kitchen and work with the space around you. Buy steel boxes like I have to keep the chaos of sugar bottles and sprinkles under control, and then either put them in cupboards or drawers, or place them on a baker's rack. Wherever you decide to house these items in your kitchen, make sure that it's an area where you don't have to take more than a few steps to get to when you're decorating cookies. It's the difference between making cookie decorating a pleasure, versus making it seem like a dreaded chore or task. I'm so glad that I now have a dedicated cookie decorating area in my kitchen.